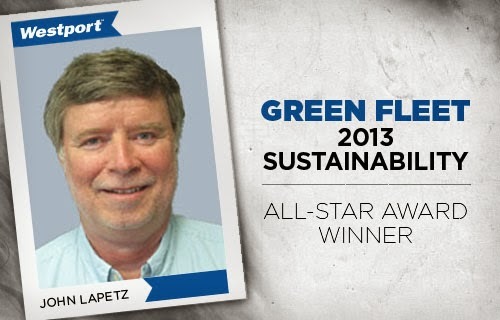 One of Westport’s leaders is now a ‘Sustainability All Star.’ Westport Vice President John Lapetz was one of 40 individuals recognized at Green Fleet Magazine’s third annual Sustainability All-Star Awards ceremony on October 2 in Phoenix, Arizona for his achievements in alternative fuel vehicle systems. John began his journey with alternative fuel vehicles at Ford Motor Company, where he worked for 35 years. After pioneering the development of Ford’s program worldwide, from natural gas fleet vehicles to hydrogen buses, as well as playing a key role in development of Ford’s Qualifed Vehicle Modifer (QVM) and FlexFuel programs, John assumed the role of Director of Technology for the Clean Vehicle Education Foundation in 2009. John’s current role at Westport includes the engineering and development of the bi-fuel (CNG/gasoline) Westport WiNG™ Power System out of Westport’s Michigan location. In June, Westport acquired BAF Technologies, Inc. and its subsidiary, ServoTech Engineering, Inc., securing its position as Ford’s largest partner under the QVM program with over 10 products and approximately 150 Ford authorized dealerships. Westport also recently announced it will offer the newly launched natural gas powered Ford F-150 featuring the Westport WiNG™ Power System in both the United States and Canada. Green Fleet magazine staff reviewed nominees who’ve achieved significant sustainability accomplishments and made innovative contributions to reducing emissions and fuel consumption. Overall industry involvement was also considered. The 40 award winners included commercial and public sector fleet managers as well as vendors and suppliers. They will be featured in the upcoming issue of Green Fleet magazine.